My father was a DJ throughout the '80s so you could say that I ended up in the family business! I started DJing Argentine Tango early in 2002, filling in at local milongas. I stepped into a musical vacuum at the now defunct Dancesport milonga and started experimenting with the music. 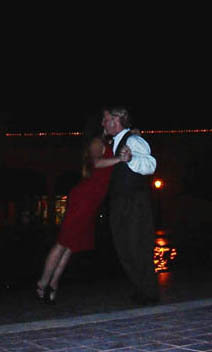 In the fall of 2002 Jan Wilcox and I were teaching a beginning tango class at the Center for the Moving Arts and got offered the late night time slot after our class. We jumped at the opportunity and started the Tango Addicts' Milonga. In the Spring of 2004 the Center for the Moving Arts was sold and the Tango Addicts' Milonga found a new home. I am currently DJing alternate Friday nights for Milonga Sin Nombre and 4th Sundays at Tango Addicts' Milonga. 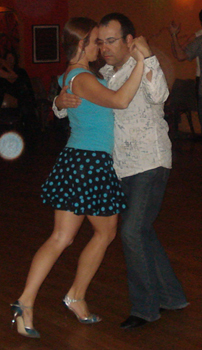 I have run a milonga nearly every week (and some weeks two milongas!) since 2002 and have DJed hundreds of milongas. My guest DJ engagements include Oxygen Milonga in LA and the Denver Labor Day Festival. I have hosted and DJed the Thursday night welcome milongas of the 2007, 2008, 2009 San Diego Tango Festival and DJed the New Year's Eve kick off milonga for the 2010 festival, as well as coordinating the Sunday All Night Milongas in 2008, 2009 and 2010 (yes, those waffles you ate at 4 am!). I am currently engaged to DJ at 2010 Denver Memorial Day Festival and Portland TangoFest XIV. I have a flexible work schedule and am available as a guest DJ for hire. Contact me by email if you are interested in a DJ with years of experience, a great feel for the energy of a room, a fun attitude and a strong command of classic tango music. I have been involved in one form of dance or another since I was four. I have studied ballet, jazz, hip hop, African, AfroCuban, ballroom and swing. 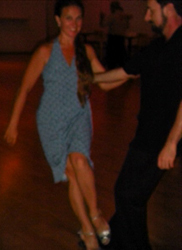 I first saw Argentine Tango in 1994 in a Reed College ballroom class, but was intimidated by my lack of a partner and continued to study American/International Tango and other ballroom dances. 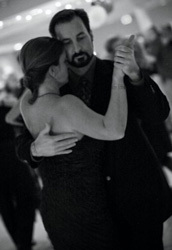 I left Portland, Oregon in 1997 just as the tango explosion was starting there and regret having left just before the development of that community as one of the best places to dance tango in the US. 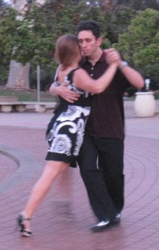 Back in San Diego I rediscovered Argentine Tango in 1999 and found that tango was my true passion. All other dances paled in comparison and I did them less and less as time went on. I still take classes with visiting instructors both Argentine and American whenever I have the opporitunity since I feel like learning tango is a lifetime pursuit, that will never be finished. A tango changing influence for me was Robin Thomas, who is a delightful lead, an insightful teacher and a pretty nice guy. He made me feel like it is not only permissable, but desirable, for a follower to be musical and have an influence on the lead. Robin made me feel like the path I had chosen in tango was the right one and set me free to pursue it. I pride myself in my versatility as a follower. My goal is to be able to dance with any leader and blend my style to his. I am known for my feet and musicality (and, of course, my shoes too). but I am 100% a social dancer. While I enjoy fun tricks and sillyness when the music, partner and floor conditions are all right, those ganchos, sacadas, boleo and other flashy things are all a combination of lead and follow and the embellishments I add. One of my favorite things about tango is when a leader surprises me with something I have never done before, and does it so smoothly that it seems like I knew it all along. And I occasionally seize the opportunity to surprise them back. My favorite leads utilize many elements of good following, they respond to my energy and let me have my own voice. This produces a musical dialogue that ensues that no two dances will ever be the same, even with exactly same partner and music. The spontaneity and endless interplay between the lead and follow are what keeps this dance fresh for me after 11 years of immersion. My favorite dancers can blend complexity with musicality, but my least favorite dancers emphasize complexity at the expense of musicality. As a leader I gravitate toward close embrace, syncopated style marked by simplicity of figures and complexity of rhythms. I enjoy the music of tango and playing with the dance within the music. Though I am still at the beginning of my journey as a tango leader, I get complements for musicality and gentleness and frequently get asked to lead. My favorite music to lead to is any good milonga (my favorite to follow to as well, but I am a VERY high maintenance milonga follower!) . My number one goal is to share my love for this dance and support the development of the tango community of San Diego. In addition to DJing at Tango Addicts' and Sin Nombre milongas, I also promote occasional Moonlight Guerilla milongas. Trying to attract new dancers I have taught a weekly free introductory class every Friday before Milonga Sin-Nombre since 2007. 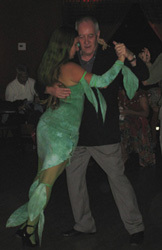 My focus in teaching is to maintain a fine balance between fun steps and developing the fundamental technique necessary to navigate on a social dance floor. 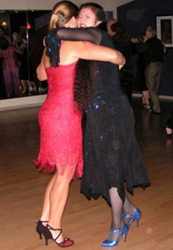 I believe that both of these aspects of dance are crucial to creating new "Tango Addicts." 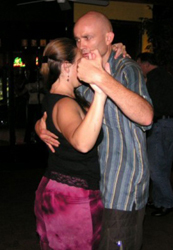 To promote unity and exchange of ideas within the tango community, I maintain TangoSanDiego.com as a resource for local dancers, visitors, and people just starting out to be able to locate teachers and places to dance tango. I also moderate a discussion group for announcements and issues about San Diego Tango.